This Rustic Bathroom Vanity with copper vessel sink was built with very old, hand -hewn pine logs, reclaimed from old log houses. The wooden top is made with furniture grade pine. The copper vessel sink is extra-heavy gauge pure copper and has a wire rolled edge. It was made like a miner's pan and sits on top of the cabinet like a bowl. The pure copper sink is darkened by a heat process to the color of an old penny. The charming bronze faucet is made by Price-Pfister to look like an old water pump. As always the cabinet is stained and finished with our special formula making the wood resistant to bathroom moisture. This special sink and faucet are included in this price and come installed. 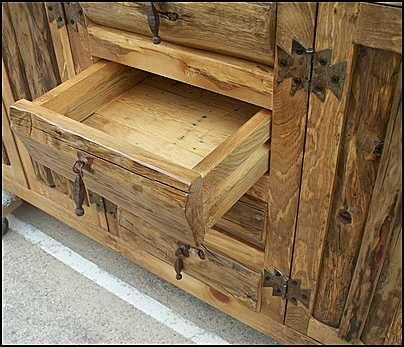 This log bathroom cabinet looks great in rustic homes, log cabins, lodges or anywhere rustic style is enjoyed. Two stacks of drawers are on each side of the center sink and cabinet area. We can build a matching mirror for you to your specifications for an extra cost. This bathroom vanity comes READY TO CONNECT to your plumbing with sink and faucet installed. THE SHIPPING COST includes crating and insurance. THIS IS APPROXIMATE AND WILL VARY ACCORDING TO YOUR LOCATION. We are located in East Texas and ship from a reputable shipper in East Texas. If you are able to pick up your bathroom vanity from our shop, the shipping cost will be waved. 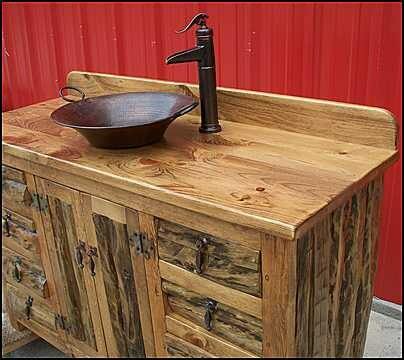 MADE IN AMERICA-- CANTON ANTIQUES specializes in bathroom vanities with sinks and faucets. We have been in business for 16 years and have hundreds of satisfied customers. Our bathroom cabinets are made with pride by us on site in East Texas. We value our customers and will gladly work with you to meet your needs for your home. 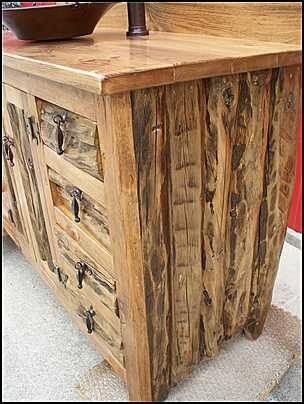 All our RUSTIC LOG BATHROOM VANITIES are made from antique, hand-hewn pine logs and come in many cabinet sizes. 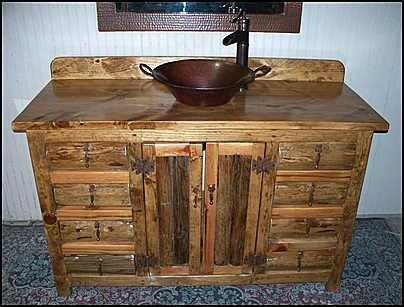 They have wooden tops and we usually use copper sinks and bronze faucets for a fantastic log cabin appeal. We have a line we call RUSTIC FARMHOUSE VANITIES made with bead board and furniture grade pine which we often finish with a paint and stain combination. They have wooden tops, and we usually install copper sinks and bronze faucets in them for a charming farmhouse decor. Please contact us if there is a problem with your order. We accurately describe our items but because they are handmade, no two items are exactly same. Pictures are for samples only. Please note that colors sometimes look different from computer monitor to computer monitor - your colors may look slightly different than what you see on your computer screen. All Sales are final unless the mistake is ours. If your item is damaged in delivery, send it back and I will replace it, and refund your postage. If you get the wrong item, send it back. and I'll replace it and refund your postage. If you just want it in a different color, I'll exchange it, but you must pay the postage when you mail it back. If it was lost in the mail because you gave me the wrong address, I cannot be responsible for that. Hope that doesn't sound harsh, but after sending out over 700 hand made-orders, things have happened that I can count on one hand. Thankfully, 99.9% of our customers are happy with our work and receive them without a problem.